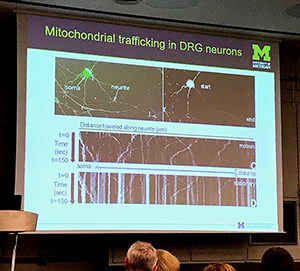 Mitochondrial transport down dorsal root ganglion axons is impaired by saturated fatty acids, a likely mechanism leading to energy loss and axonal neuropathy in Type 2 diabetes. The slide is from a lecture from Prof. Eva Feldman’s lab. The 13th Congress of the Peripheral Nerve Society (PNS) took place July 8-13, in Sitges, Spain. The PNS hosts annual congresses, and the next congress will be in July 2018 in Baltimore, Maryland. In 2019, it will take place in Genoa, Italy. For the International Congress on Neuromuscular Diseases (ICMND) 2018 in Vienna, the Neuromuscular Congress of the Research Group on Neuromuscular Disease of WFN, it is planned that a joint session of the PNS and ICNMD will take place. The Congress of the PNS is devoted to the peripheral nerves, not only on clinical entities, but building the gap between basic research and toward the clinical implications. This year, there were 500 participants from more than 50 nations. The PNS has a strong emphasis on education, and about 100 young participants were sponsored to attend the meeting in order to present posters and platform presentations. The scientific content contained many basic and translational aspects, such as the molecular aspects of node of Ranvier, the metabolic support of axons by Schwann cells, and the new models of auto-immunity to nodal components. Also, pain and ion channels were discussed in plenary lectures. Sitges, Spain, proved to be an attractive site for the Peripheral Nerve Society Meeting with excellent meeting facilities and attractive beaches. One of the concerns of the PNS is the research and treatment of inflammatory neuropathies. Treatment studies and open questions were discussed. Another important aspect is diabetic neuropathy, where worldwide an increase of diabetes as a noncommunicable disease is being observed. Mechanisms and possible treatments were discussed. The role of changing food habits, lack of exercise, and lifestyle seem to contribute to this development. 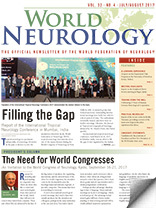 A future strategy in a worldwide campaign against diabetic neuropathy was initiated. Several papers and posters addressed issues of genetic neuropathies. Increasingly, chemotherapy-induced neuropathies are attracting attention, not only in regard to prevention, but also pain treatment and management. Neuropathic pain was a topic, and ion channels, particularly the PIEZO2, STOML3 channel, were explained and discussed. They will have an impact on our understanding of neuropathic pain. Also, the poster sessions contained several reports on treatment of neuropathic pain. Daily poster sessions were filled with attendees. Many discussions and interactions took place. Many interesting and often rare observations were displayed and discussed. For scientific papers and merits, traditional prizes (as, for example, the PK Thomas prize) were awarded by the PNS. In the final ceremony, Steven S. Scherer took over the presidency from Mary M. Reilly. 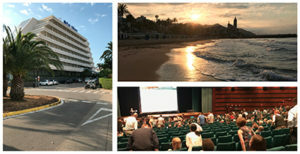 The congress was held in a nice venue–the Melia Hotel Sitges. Traditionally, as is familiar to all PNS meetings, the atmosphere was good and open, and interactions were encouraged. It was excellently organized, and provided a useful platform to exchange ideas and to engage in networking.